For about two years every once in a while my temp gage in my truck will show it overheating for less than 30 second and then go back in the middle and be normal for the rest of the ride. In that time I had the radiator and water pump replaced and I changed the thermostat twice to try to fix the problem and none of this worked. What happens is within maybe the first 15 minutes of driving the gage spikes up and then goes back to normal and doesn't do it again for the whole ride. 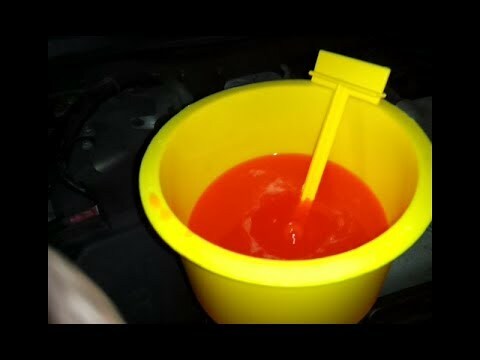 Sometimes when I park and look under the hood the antifreeze overfill lid will be popped off and you can tell that antifreeze was shooting out of the overfill. The hose to the thermostat is also always tight and not squeezable. My mechanic thinks its the head gasket but I cant see it being that. Its been happening almost every time I drive it from cold now. It seems like a thermostat problem, but I'm not sure. If anyone can help me it would be much appreciated. How about if you let it idle and come up to operating temp while your watching what is going on under the hood. You may be able to put a big funnel on the radiator and then watch what happens with the coolant as it come up to operating temp. You should also feel the temperature of the hoses and the air blowing from the radiator fan change as the thermostat opens. Usually, yes. If combustion gases are getting into the coolant system because of a head gasket issue, it will basically over heat because those gases will displace the coolant in the system and create air pockets. You'll also notice the heater doesn't blow hot air when that happens. Another indicator is if you see lots of bubbles in your funnel. You can try the block tester kit to see if you have a leak. Sometimes those block testers can be inconclusive though. Has your mechanic tested for combustion gasses in the coolant system? If you keep having to add coolant to the radiator, you probably have an external or internal leak going on. Has your mechanic pressure tested the coolant system when the engine is cold to see if there are any leaks? Another trick to see if coolant is leaking into combustion chambers is to pressurize the system overnight with the spark plugs removed. If you see coolant laying ontop of a piston after it has sat, good bet you have head gasket issues. Check this without pressure and while cool. Is it real squishy on larger, longer area? An issue can happen with strong water pump, high RPM and load on cooling system that suddenly gets cooled with t-stat wide open pressure of pressure cap is lost for a short while and this hose squishes shut tight - no flow, fast overheat which expands it to look normal in a second. Was common with long lower hoses so they put a spring inside such that they couldn't collapse. New hose if so almost certainly didn't come with a spring if used at all? You put the old one in the new hose now. Said, it's somewhat rare but was a reason for sudden real overheats then fine like you described and all would check out fine. Very few you can see it do it revving engine and looking at that hose. Even if not required OE and hose is good I'd put one in. I went round and round with the "spring in the hose issue" with a parts supplier. The new hose on a vehicle I was working on didn't come with the spring in the hose. The old coil of wire was rotted out. What I ended up finding out is that the spring is used during factory vacuum filling of the coolant system when the vehicle is on the assembly line. Other than that the spring serves no other purpose. If your sucking the hose shut as the pump is spinning faster, you have some sort of restriction going on. If the hose collapses when the engine cools off, you have a problem with the radiator cap or a restriction in the coolant reserve tank. The hose can't collapse any how because normally the coolant system is under pressure when at operating temp. Understood DS. I said "rare" - it was then and would be now. Those that were clear enough you could watch it do it, grab the hose, no spring in it, put one in or buy a new hose that ALWAYS had a new spring - problem over. So.......... They clearly are not needed for a lot of reasons on many. Hoses aren't as long or large and more molded which is by itself harder to squish shut. There's the smaller hose on that too? I'd have to follow that to know why it's there and from what. I suspect a return hose from heater but hardly makes sense unless this thing was made without a heater or something. I can't see where I by-pass concept to keep coolant all the same temp would use that at all for that purpose? IDK and apparently some who've looked at it aren't so sure no surprises sometimes with that either. It was the sudden blast of overheat that caught my attention. Flash boil enough to blow a cap off recovery tank! What could do that then calm down later? I'd be hunting for reasons. Head gasket would be first but like you said it would do it almost every time. Never saw one heal for a while then just do that and quit it. Do we know (OP do you?) is this full of sealer or something to confuse a good diagnosis? Sometimes if you have air pockets in the system, it will do odd things like the OP is having. Putting a funnel on there and running the engine till the T stat is open and squeezing on the hoses will probably get rid of pockets. Even when doing a vacuum refill on most vehicles, I put the big yellow funnel on and run the engine to purge air. Amazing what air will find its way into.